15.000.000 strokes occur worldwide each year. Roughly 50% of the patients suffer from Hemiplegia, a condition that inhibits you from using one side of your body. Typically, one of the first things you need to do is to relearn walking. Unfortunately, intensive rehab often stops too early. Next generation stroke rehabilitation robotics, done in collaboration with ABB LTD. Together with ABB Corporate Research we spent 7 weeks developing the future of collaborative robotics. Focus has been on exploring human-product interaction and interactive prototyping. 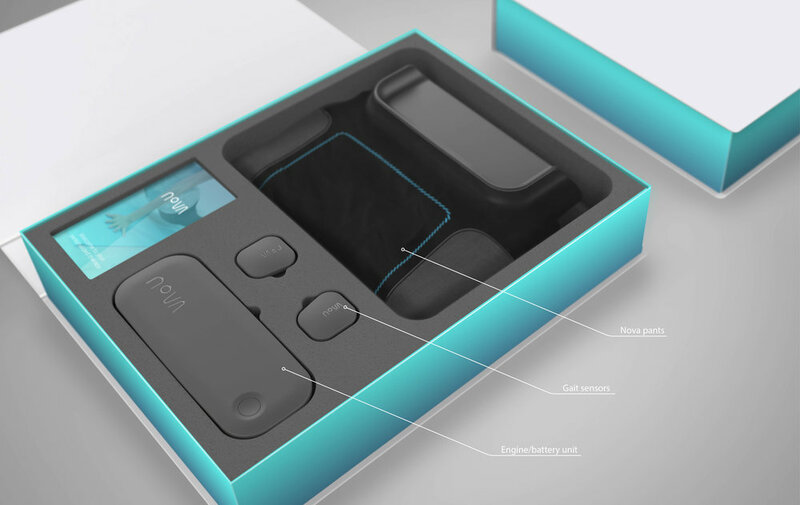 Meet Nova, the new home rehab guide that will help patients to relearn a healthy gait throughout the day. Motion trakcing sensors combined with smart textiles will teach patients how to walk correctly again. Nova is your new home rehab guide that will help you to relearn a healthy gait throughout the day. Integrated sensors measure your movements and will vibrate once you put your body weight on your strong side for too long. Contracting cables at the inside of your joints indicate how to walk correctly. Slightly contracting cables at the inside of your joints give the brain a hint of how to perform the correct muscle movements. Integrated zippers and straps guarantee that you can put on nova with one hand only. Yet they’ll be tight enough to stay in place. Our integrated battery and efficient motor will get you through the whole day. 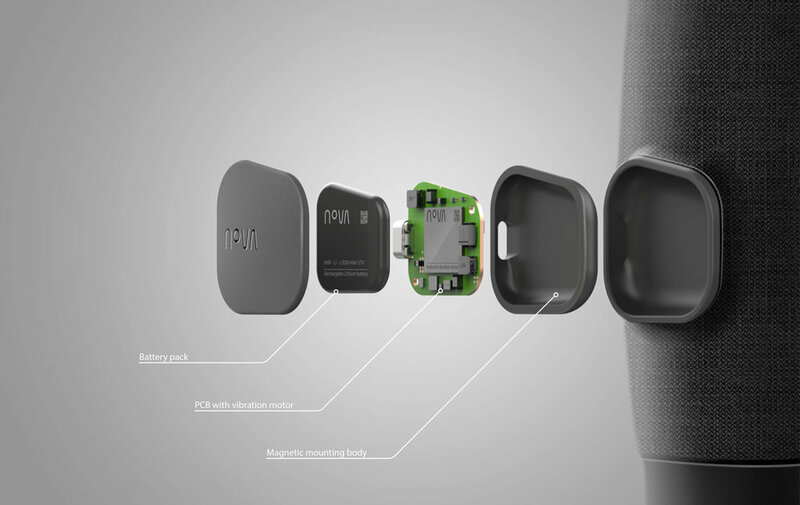 All electronic components can easily be removed from the pants for charging. Hereby, the pants are also washable! By owning more than one set of pants (but only one set of electronic components), you can simply plug the components into your second pair and wash the first one. Gait sensors are placed on the lower parts of the legs to track the motion and compare this (through triangulation) with the main unit placed on the back of the trousers. By doing this we create an accurate profile to measure the patients gait. The app monitors the patient throughout the day and gives life feedback on the exercises and gait. This means you don’t have to wait for the big improvements to become visible though: It provides immediate feedback, sends you reminders and guides you through your daily set of exercises. This way, your brain gets enough stimulation for a successful recovery. The information will be directly communicated to your therapists and doctors. They can see in-depths information about your rehab process and adjust the treatment to your needs at any time. 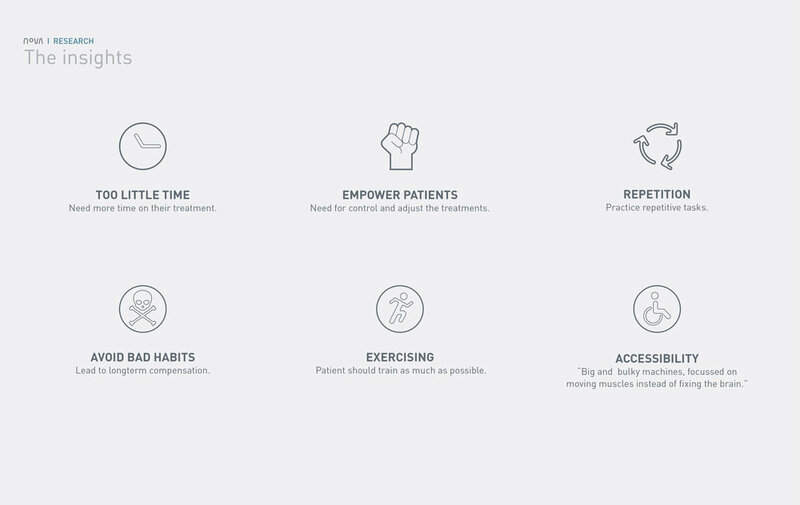 The physiotherapist’s app provides more in depth statistics than the patient’s and resembles a management tool. The initial vision was to explore how robotics could help stroke patients to overcome hemiplegia, a condition where half of your body is in a similar state to paralysis. Luckily, hemiplegia is often treatable and the functioning of the body can improve through an intense regime of physical therapy. To find out more, we went to the Neurorehab centre in Sävar that offers specialised treatments. We wanted to find out more about the beginning of the treatment process and hence went to the Umeå University Hospital that provides both immediate care and home visits. The therapists showed us exercises stroke patients usually need to do as well as their equipment. We found out that the improvements decrease tremendously once patients leave the hospital. Often, that is already after a couple of days. Sketches were made and concepts were prototyped to test and validate with users and healthcare specialists. Looking at our ideation sketches, the one that fulfilled most of our criteria (accessibility, size, price, empowering patients) was having rubber bands inside the joints that slightly contract and hereby guide you to move correctly. On an existing pair of sport pants, we marked where the rubber bands would have to be positioned in order to indicate the right movement and be supplied with power and information. Tests were done to see how people would react to vibrations on their legs by taping phones around their ankles. It turned out that people tend to shift to the side where there is no vibration. We wanted to hear the opinion of the therapists that we had visited during our research. They were positively surprised by the concepts. At this time, we already a “functioning“ prototype of the pants and app to explain how it would guide the users through their day and exercises. The idea that these pants could be worn throughout the day and would give stimulations to the brain instead of the muscles was the major improvement in comparison to what is out there. The therapists mentioned that is would be very beneficial for them to get statistical information of the patient's activity and what time they do their exercises. This was integrated in the final version of the app.